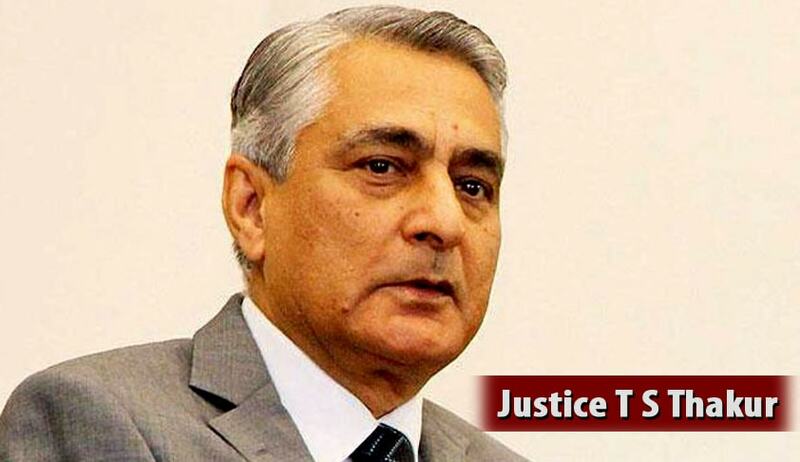 Government’s initiatives to bring in more investment from abroad including ‘Make In India, ‘Skill India’ will bear fruit only if there was a more effective judiciary in the country, Chief Justice T S Thakur has said. “In this country, 18,000 judges are handling 50 million cases. The avalanche of cases is putting the judicial system to tremendous stress. A major concern any foreign investor has regarding safety of his investment is the efficacy of the judicial system of the country where he is going to invest. It is intensively and deeply connected with our ambition of attracting more and more investment from other countries. Arbitration is good. But real trouble starts after the award. If challenged, the case remains pending in a court for decades. Then what is the point?”, said the Chief Justice. The CJI said the government wanted FDI, people to come from abroad and make in India, invest in India but reminded that those whom it was inviting were concerned about the ability of the judicial system of the country to speedily deal with disputes that may arise in connection with such investment. “So efficiency of the judicial system is virtually connected with the development of the country”, he said. Thakur went on to say: In this country, 18,000 judges are handling 50 million cases. The avalanche of cases is putting the judicial system to tremendous stress. At present there is a vacancy of 5,300 judges in subordinate courts and 450 in High Courts. The comments came at a time when the total case pendency across the country stood at 3.3 crore. While 2.65 crore are stuck in subordinate courts, 64 lakh are pending in high courts. The most worrying part is that nearly 60 per cent of these are over one year old and of them 40 per cent are more than five years old. 59, 458 cases are pending in Supreme Court. The CJI has been saying that India had just 18,356 judges while the actual requirement today was 50,377. Referring to recent amendments made to Arbitration and Conciliation Act to make the process of out of the court settlement of cases hassle-free and timely, Thakur said “arbitration, conciliation and mediation, the old way of settling cases is relief not only to litigants but the overworked courts and judges. “In this country, right from apex court to a Munsiff court, judges are over burdened, overworked. Arbitration is a good idea but again the real trouble starts after the award. Once it is challenged, they keep pending in the court for decades. The prolongation in courts should be take care off. Otherwise the entire benefit of arbitration is nullified”, he said. “We are poised to overtake China and US in terms of economic growth and each Indian should be proud of that. But we remain very low in terms of ease of doing business”, said the CJI. The Conference comes in the backdrop of the immense losses suffered by the business enterprises and the economy at large, due to enormous backlogs involved in dispute resolution in Indian courts. This keep resources and money of the businesses trapped till resolution of the dispute. This is a major disincentive for foreign companies coming to invest in India. So they seek alternatives. One such alternative is arbitration which can be cost effective and quick. Increasingly, foreign companies that partner with Indian businesses are approaching countries outside of India for dispute resolution. In the World Bank Report on the Ease of Doing Business India has improved its position by 12 ranks. However, on the Enforcement of Contracts India fares extremely poorly and ranks 178 out of 189 countries. The World Bank Report suggests that improving the mechanism to resolve commercial disputes in India will go a long way in bettering India’s rank. Many Indian companies are going to foreign arbitration centres like Singapore, London and Paris taking a huge chunk of dispute resolution business outside India. Statistics make this picture clear. In 2012, 49 of the total 235 cases in Singapore International Arbitration Centre (SIAC) involved an Indian party. This figure grew to 85 out of 259 cases in 2013. India has already undertaken major structural reforms to facilitate ease of doing business recently, including legal reforms to revamp the existing arbitration framework. The Parliament has recently passed an Amendment to the Arbitration and Conciliation Act, 1996. Moreover, the Commercial Courts, Commercial Division and Commercial Appellate Division of High Courts Act, 2015 has been passed to fast track commercial dispute resolution. Building over these reforms, the initiative by Government and Judiciary will help to improve the institutional capacity necessary to create a vibrant ecosystem to make India the next big hub for international commercial arbitration. Read more news about Global Conference on Arbitration And Enforcement In India here.